Last summer, things were somewhat chaotic for two early buildings by giant firm Hellmuth, Obata & Kassabaum (now HOK) located on Lindell Boulevard. 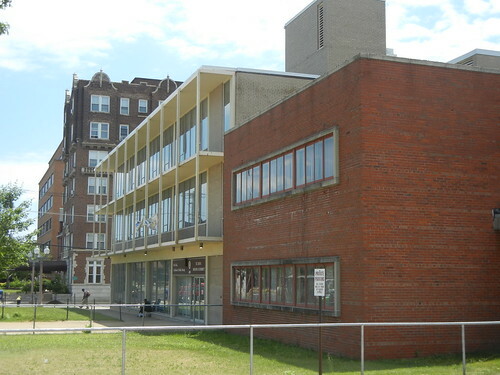 While the old IBM Building (1959; 3800 Lindell), now Adorjan Hall at St. Louis University, lost its brise soleil, the former Sperry-Rand Building (1956; 4100 Lindell), most recently the St. Louis Housing Authority headquarters, was facing uncertainty. Things have changed — just a bit. Now the Sperry-Rand Building is on the market listed at a little over $1.1 million. That price might be low enough to be in “tear down” range in some cities, but in St. Louis that seems to be a price that might encourage buyers who would retain the building. Whether those buyers would retain the building’s character is another question. George Hellmuth, Gyo Obata and George Kassabaum had only been in business as partners for one year when the Sperry-Rand Building opened its doors. Admittedly the firm would reach greater heights than this modest three-story business block, but its form and minimal treatment remain elegant. 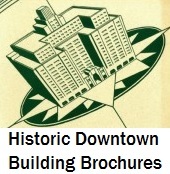 Furthermore, the Sperry-Rand Building offers a great combination of urbanistic traits: the building maintains the ample Lindell Boulevard setback, which gives that street its monumentality, while opening its first floor with large full-height windows and its floor level near sidewalk level. 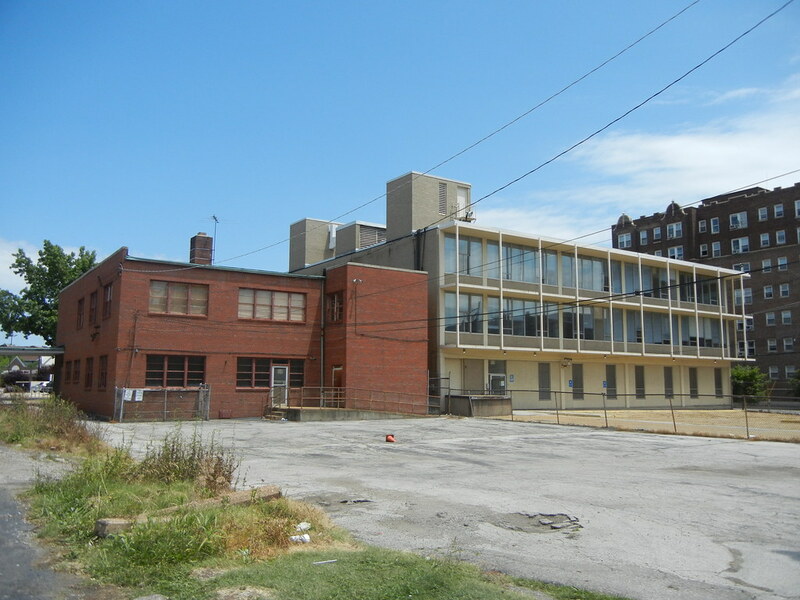 In short, the first floor could be adapted to retail use quite easily, adding activity on a corner close to emergent redevelopment on Laclede and West Pine avenues. Looking east across the street wall toward the Sperry-Rand Building. 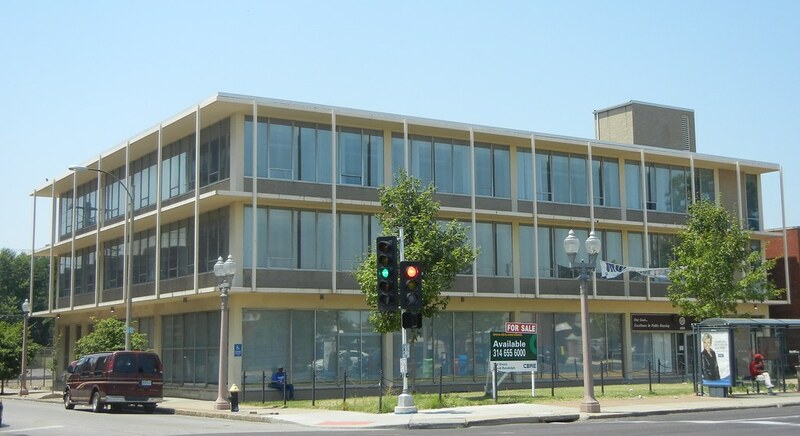 As an early work of a major firm, and part of the reconstruction of Lindell Boulevard through Modern Movement architecture between 1939 and 1977, the Sperry-Rand Building is eligible for listing in the National Register of Historic Places. The building’s historic context will become even clearer as the Cultural Resources Office and its consultant completes the development of contexts for non-residential Modern architecture in the city. That project, including a survey, is underway and will be completed in 2013. Already known is that the building is one of at least 37 Modern buildings built between Grand and Kingshighway on Lindell at a time when the city was struggling to enliven its core. Corporate office buildings like the Sperry-Rand were signs of needed investment, and their confident Modern architecture reflected optimism. The rear of the building. Lots of parking. 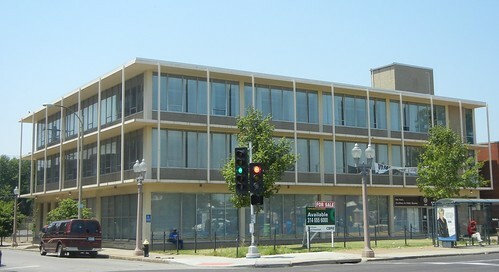 The Sperry-Rand Building also offers ample parking in back on a lot shared with the former Easter Seal Society Building to the west (1960), also for sale. That space could be used immediately for its function, or built out with additional construction and structured parking. Someday, we can hope, the Lindell Marketplace will be dramatically reconfigured to appropriate scale and density. The wreck of 3949 Lindell Boulevard will soon be rebuilt. Sarah Avenue has gained several establishments. This corner building is a key connector, built in an adaptable urban form. Perhaps higher density will rise around it, but there is nothing amiss with the building’s scale. This is a small gem that needs to shine again. This entry was posted in Central West End, Mid-Century Modern, Uncategorized. Bookmark the permalink.